Insync is an unofficial Google Drive client that runs on Mac, Windows and Linux. Insync beta 4 for Linux has been released yesterday, bringing support for GNOME Shell, Cinnamon and KDE. Insync for GNOME Shell and Cinnamon comes with a native extension which has the same functionality as the Ubuntu appindicator, as you can see in the screenshot above. 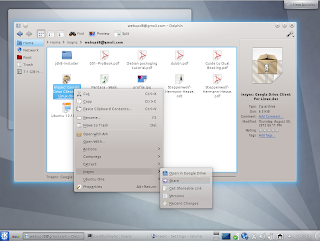 The new version also brings partial KDE support: there's context menu support for Dolphin and two optional Plasmoids that integrate Insinc and thus Google Drive into the desktop, however, the Ubuntu AppIndicator is still used in KDE at this time. fswatch.py now handles odd errors that inotify could produce, and other runtime errors. you can now sync hidden files (that start with a "." dot) by starting Insync with "--allow-dot-files"
Note: To avoid conflicts, if you've had Insync installed, firstly remove it ("sudo apt-get remove insync*") and then install the package for your desktop environment: Ubuntu (using an AppIndicator), GNOME3 (they call the builds "GNOME 3" but they are for GNOME Shell), Cinnamon or KDE. In GNOME Shell, you'll have to activate the Insync extension using GNOME Tweak Tool.